Trying to find interior paint colors that will look good in your home? We'll keep you busy here - our guides to choosing paint color will lead you every step of the way. Nothing is more powerful when it comes to making a statement and expressing yourself, and more affordable when you need to make a room style change, than paint color. However, for most people, choosing a paint color is the most difficult and frustrating part of any home design project. But it doesn't have to be. Take your time, explore this website, and learn about how color works. Even a little knowledge will give you confidence in your abilities to choose and coordinate paint colors, and move you one step closer to creating your dream home. And if you find yourself stuck or overwhelmed by thousands of interior paint colors out there, look into the Paint Color Cheat Sheets concept or visit our "Paint Colors Critique Corner". 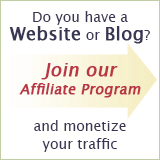 We'll help you out, and it's FREE! Choose a wall color in an empty/bare room or in a paint store, and you are almost guaranteed to regret your color decision. Do YOU make these common mistakes? Learn why you need to stop once and for all! Did you know that most people approach selecting their home colors and finishes backwards? And while it's tempting to start with the most fun part - paint colors - patience and following the right order for choosing colors for your home will really pay off in the end. When it comes to creating a home you'll love to live in and be proud to show off, you have to "know thyself" first. This little questionnaire will help you get clear on your decorating goals and preferences, and guide you to the right decision. Feel like you don't have the "color gene" or a "good eye for color"? Not to worry - all of that can be learned, and practice will make everything perfect! Follow these steps to start developing your "color sense". Like to watch those home improvement and decorating shows on TV? It turns out, they can be more than mindless entertainment after all... especially if you pay attention to the systems/processes the designers use, and then try them out on your own to (hopefully) get similar results! Have you ever painted yourself into a corner... color-wise? Few people realize that it makes a big difference where you start when choosing interior paint colors for a room or the entire home. For example, some "starting points" make it easier to "weave" your color scheme, while others just lead you to a dead end. If you want decorator results, be willing to do what they do. Professionals don't have to reinvent the wheel every time they tackle specifying interior paint colors for their clients, because they have a proven process that works every time they use it! Here's a fun approach to picking and coordinating wall colors: just treat the process the same way you do pairing and coordinating your clothes! Because if you can dress yourself in style, you've got everything you need to mix and match colors in your decor, as well. Here's a tutorial for pulling interior paint color ideas from your existing decor (fabrics, accent pieces, wall art) - a very easy and effective way to get paint color ideas for the walls. In fact, it's as simple as painting by numbers! Learn how to create a sense of color flow and continuity with these 4 tips - for instance, how to add variety through shade variation, "marry" the walls with the ceiling and woodwork, and unify your entire home with a common link of color. Open floor concept homes present different painting challenges than regular homes where each area is clearly defined and closed off/separated by the walls. So here are some different ways of painting a home with an open floor plan. How do you find an interior paint color for the fifth wall (a.k.a. your ceiling)? Based on the type of your ceiling, its height and your overall vision for the room, your choices should be very different - ranging from a basic white all the way to a ceiling painted a night sky blue. There are 3 ways to paint trim - a shade of white (conventional look), a tinted white (softer look, for those who don't like harsh contrasts), or a completely different, but properly coordinated paint color (contemporary look). So enjoy these helpful tips and guidelines for deciding on interior trim colors. A typical paint color deck can contain as many as 200 different shades of white, so how do you know which one will be the right shade for your particular situation? Start with these tips for coordinating your trim color with fixed white finishes. In this tutorial, you will learn how to coordinate trim with wall paint color, and how to zoom in on a white shade with just the right undertone that will work with the color of the walls. 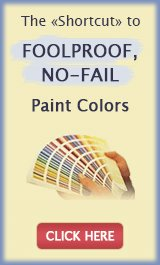 Do You Copy Color for House Painting? Are you a copycat when it comes to interior paint color ideas? 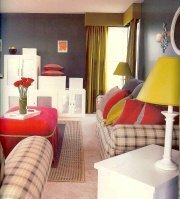 Discover why it's a bad idea to copy the colors you saw in your frien's home or in a shelter magazine. Borrowing (and then tweaking) color ideas? Thats perfectly fine, on the other hand! Want to know how to figure out what your natural color bias is? It's easy - just think about the natural settings/environments you find the most visually appealing, or peek into your closet to figure out what colors and combinations you tend to gravitate towards. These basic principles for coloring a home have withstood the test of time and are as valid today as they were decades ago. The main points are, limit your home colors to just a handful, and make sure you home style and size is appropriate for the colors you've selected for it. The 3 things you need to consider before you start painting are your personal preferences, likes and dislikes; the existing decor elements and lighting in your home; and the effect your are trying to create in a room (relaxing, energetic, etc). See how to get ideas for successful interior paint color combos from the handy little tool called Color Wheel. You will learn its formulas and get some guidelines on using them successfully for painting or decorating your living space. Have you ever played the "picture color game"? It's how some designers learn about what you like, what leaves you indifferent, and what makes you go "Eweee!" in the color world. You can use this process on yourself too - you'll be surprised at what you discover about your taste! Need a Home Painting Estimate? 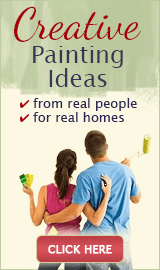 Copyright © 2007-2016 HousePaintingTutorials.com. All rights reserved.